To celebrate Easter, ALL orders through April 5th will receive a free SIGNED 8×10 print of “He is Risen”. Easter is a wonderful reminder that there are such things as miracles and happy endings. Like the ancient Easter story our own lives are often filled with times of trial, sorrow, heartache and pain. Perhaps nothing in life challenges us so universally as the experiences surrounding death and suffering. Most of us are familiar with the fear of facing our own mortality as well as the deep loss and grief we feel when death takes from us someone we love. The heaviness of these dark hours can often feel well beyond our strength to bear. This is when the message of Easter can help us endure, giving us increased understanding that even the darkest night will end and one day all suffering will cease and all tears will be wiped away. There is life after this life, peace after the pain, daylight after the darkness and happiness after heartache. Easter is more than a reminder that there are happy endings, it is a symbol of new beginnings. The dawning of a promised day of eternal life filled with peace, love, and joy! Thank you for this! It is very encouraging and uplifting. I love all your art. Unfortunately I can’t afford to buy any now. I do have a few of your works on my wall at home that I was able to get some years ago..
My whole life from my conception though my birth. and my life has been filled with the blessing of our Father. It all started 67 years ago last month.When my mother met President McKay on temple square. and he asked her what was troubling her. He said he would give her a blessing after conference. A great message from my high school friend, Greg. Thankyou for all your truly beautiful and uplifting pictures , that brighten up ones day , pointing to our Eternal Home and Hope IN CHRIST. As such , we as Christians , feel a United hope , as we connect with SO many other Christians world wide…..we are not few , but many. The opportunity to often share with non Christians , via a picture and verse, has the great potential to reach lost souls. So GOD bless your efforts. 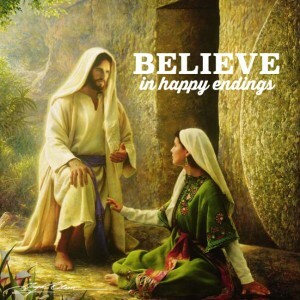 I believe in happy endings because He lives. I love your painting. I have 3 in my home. I would really enjoy this print as well. Thank you! What a wonderful message! Thank you so much.